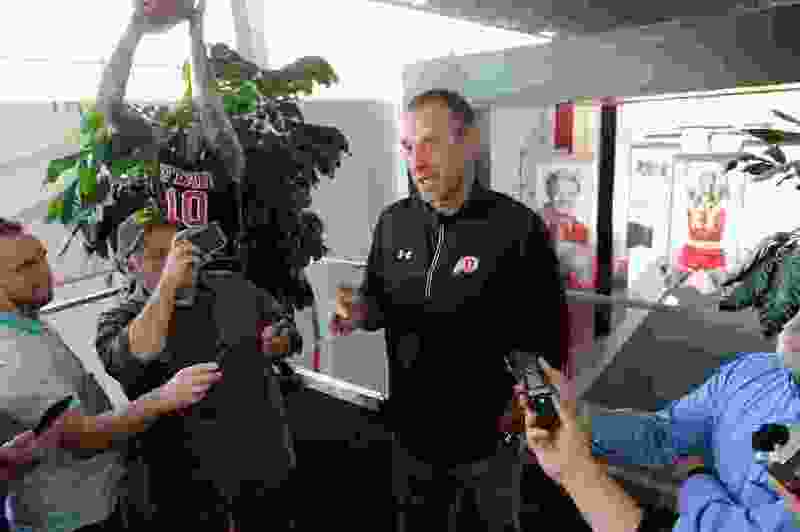 The original White team that basketball coach Larry Krystkowiak dressed for the Night with the Utes resembled a starting lineup, if the Utes had opened the season Wednesday. So the Reds' victory in the first half of the scrimmage at the Huntsman Center could be viewed either of two ways: The Utes may have more depth than ever, or they may lack a clear-cut top five. Krystkowiak's answer was a mixture of the two theories. The White lineup of guards Sedrick Barefield, Donnie Tillman and Sedrick Jones Jr. and forwards Novak Topalovic and Timmy Allen lost 34-31 to the Red in the 20-minute opening half. Several players switched teams for the 16-minute second half, with Barefield leading the Red to a 36-25 win. The combined scoring leaders for the night were Barefield with 19 points and Tillman and freshman Both Gach with 15 each. Allen was declared the winner of a dunk contest (determined by fans' cheers) and the Ute men's and women's teams split two 3-point shooting contests. As for the men's team's progress, “We're still getting better every single day,” Barefield said. Utah’s personnel outlook has been affected by injuries to junior forward/center Jayce Johnson and freshman forward Lahat Thioune — each with a broken foot. Johnson’s injury is less severe; he’s expected to be available by the end of October. Thioune will miss about three months, Krystkowiak said. The Utes are more comfortable being the arrow than the target. After being picked 8th in the Pac-12 preseason poll, they’ll have plenty of chances to put a point on it. Thioune had proven to be shot-blocking force in practice, Krystkowiak said. He may be able to return for a significant portion of the Pac-12 schedule; if not, redshirting will become a likely option. The Utes will play a closed scrimmage against a Division I opponent Oct. 27, then host College of Idaho in an exhibition game Nov. 1.